Save on BARDIA Closed System Drain Bags here. The Drainage Bags are sterile with sample port and an anti-reflux drip chamber to help prevent urine reflux. Safe. Lightweight. Sturdy. Easy Storage. I use this drainage bag daily from the time I go to bed until I rise. I move around a lot while sleeping but have no problems with this drainage bag. Safe. Lightweight. Sturdy. best bang for your buck !. Safe. Lightweight. Sturdy. strong hanger. economical . wish they had a t-tap dra. long term use. Following Surgery. Emergency. long term foley. quad female. Confined to Wheelchair. This is a great, dependable drain bag that is more than suitable for long term use. The sturdy hanger is great for the bed frame and for hanging on the chair frame at night or under the wheelchair during the day. I have both bought cases of these bags over the years and on occasion been provided these by insurance. The only thing I would change on these bags is the drain. A t-tap drain is still easy to use and much less likely to be accidently kicked open by a stray leg spasm. With external catheter. I would like to see disposable bag! Confined to Wheelchair. Supra Pubic Catheter User. The catheter bags are used with my supra pubic catheter. These bags are sturdy, drain great, and have zero urine odor released from them. How do you keep the catheter on the plastic end since it has no groves on the green end. .The catheter keeps sliding off the end.Something I am missing.Also there is no give to the tubing .It just will not relax. Where is the urine sample port on this bag? Is it needle or needless ? Can I dismantle the long clear tube from outside his catheter to be able to flush out the tube and how often is this usually done for sanitary reasons. It can be separated, but not recommended unless you can use sterile technique. 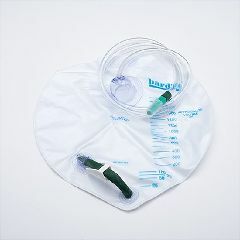 If you have to separate it , you must use sterile gloves, and have something sterile to put the end of the bag tubing on while you hold the catheter at least one to two inches from the tip with your other hand while you irrigate the catheter with a sterile syringe and sterile solution - sterile water and a medication ordered by the MD. If you happen to touch the end of the catheter or tubing, you should wipe the end with betadine placed on a sterile 4x4 sponge before reconnecting. This procedure usually is only done if the catheter is clogged or the MD orders medicine irrigations. Just rcvd Bardia bag #802001 and can't figure out how to release clamp to empty bag without sliding it all the way off. please help! There is a 'latch' on the end of the drainage tube which can be lifted enough for the bag to drain. Then lock it back in place to stop draining. how long is the tubing on this bag? Lokking for a 5ft. length. what is the best way to sanitize these bags for my mom? The tubing length is listed at 50 inches but the usable length is about 4 inches shorter because of the distance from the insertion into the bag through the hangar. Running tap water through the tubing will help keep the crud down in the tubing. For the bag a bleach solution swished around for a few minutes will really cut down on the odor. Have used a foley since 85. Is there a way to sterilize the bag before reusing it? Is vinegar the best way to rid smells in the bags? We use water and vinegar to flush the bag out in the evening and always use alcohol wipes on the tip to avoid UTI's. My wife has had a catheter for almost two years now with very few problems. I don't use vinegar , instead I use bleach. It is the best when getting rid of bacteria, odors and so on. First I rinse the bag in hot water, then drain, next put about half more hot water then about a cup of bleach. I send it down the long hose, cleasing the tube as well. Then squeeze it a bit to mix well. Let set for 1/2 hour to make sure it's all clean. After it's done, then drain bag and rinse good with hot water, leaving the drain open so you can flush everything out. Then I just hang mine up in my shower it's been custom made, just let it dry out. I also use the blue cap to seal the tube while drying. Sounds like a lot, but not really, I change bags about every 2 weeks, wear one while cleaning the other. This works for me, plus my nurse agrees. I tried vinegar but could not handle the smell of that. Of course everyone has there way, this is mine....hope it helps others! The one with the plastic hook is 802001. Allegro sells both but I had to look elsewhere online to find out which was which. Good luck! Is this bag still available to order ? I do not know if you can buy them locally in your area but AllegroMedical.com does have free shipping offers and sales so that may work for you as well. These are great bags. I'm not sure where you could buy them locally in Houston. I sometimes purchase them from a pharmacy in Harrisburg,PA but it's so much more convenient to buy them from Allegro Medical, online. Their prices are great and the home delivery is fast! I purchase them online and usually have them delivered to my door in 2-3 days...and that's normal shipping. I don't know about Houston TX but try phoning around. I needed a bag quickly a couple of months ago and the only place in town that carried them was the only medical supply pharmacy in this area. When I phoned, they switched me to 2-3 clerks who didn't know what I was talking about. Finally one hunted around on the shelves and found one. I would think any home health store would carry them. This is one of the most widely available bags and should be available locally. The price is the real consideration. Often when it comes to these types of products the local places have a much higher price than ordering it by the case.